It had been well over a decade since I’d last set foot in the fast-flowing river very near Colorado’s Continental Divide with fly rod in hand. The change in esthetics surrounding the waterway was extreme. The alteration in environment most obvious was how the once little town at its headwaters had grown so substantially it was now surrounding its banks several miles further downstream. One good thing was there was more angler access to the river; the bad was the rainbows, browns, cutthroat and brook trout in this flies-only catch-and-release section had all been fooled at one time or another by just about every type of fuzz and feather combination one could imagine. To say the fish that reside here all winter are weary of every offering that wafts past them is an understatement. Luckily, I consulted with those in the know at the local fly shop and was able to catch a few of the finicky fish because of the tips and tricks they shared. What I found interesting was there was little reform from years ago when it came to the tiny, down-to-size-22 nymph imitations that were suggested I drift under my strike indicator. The one thing the fly-flinging professionals were adamant about this time around, however, was that fluorocarbon leaders were a must if one were to fool a fish into striking. The rod I packed in my carry-on was a 4-piece, St. Croix 5-weight Imperial, perfect for the miniscule nymphs I bought at the shop. A couple packets of Seaguar’s Knotless Tapered Leaders in size 7X (thinning down to 2-pound test at its tip) were also purchased. A few of my casts were actually flawless enough to fool a few fish; in reality, more fish than the last time I was here. And I do believe it was the presentation of my flies and the hook-setting abilities of this thin 100% fluorocarbon line that made the difference. Fluorocarbon is now a standard go-to for so many fishing applications, including fly fishing. More fluorine atoms and less hydrogen than monofilament is what makes fluorocarbon pack more mass into the same space. It’s more compressed because the fluorocarbon resins give it close to neutral buoyancy. It’s a great choice for vertical personations, like dangling a fly under a strike indicator. It also has less stretch due to its denseness, which allows an angler to get good hook sets; especially when using the light-pound-tests lines needed for proper presentations of such minuscule bugs during the winter months. But it’s not just nymphing on ultra-light tippets that take trout during the winter months, especially when targeting the largest fish in a system. Maddin’s been using fluorocarbon tippet material for stripping big streamers for years, and says this tactic is no place for light line and finesse, even when these cold-blooded fish seem lethargic within their ice-water realms. “You’ll have to slow up your stop-and-go retrieve a little compared to when the water’s warm, with longer pauses in-between pulses, but you really don’t need to lighten up your leaders,” Maddin adds. Twelve-pound-test (1X in Seaguar’s Max Fluorocarbon Tippet Material) is the lightest Maddin may tie on, but overall 14-pound test (1X in Grand Max Tippet Material) is his go to. No matter the test, it’s the condensed make up of fluorocarbon that keeps his streamers in the strike zone, neither rising or falling on the pause. Two things rookie fly anglers often overlook when their planning a winter’s fly-fishing excursion is the time of day to hit the river, as well, taking a few extra precautionary steps for one’s safety. 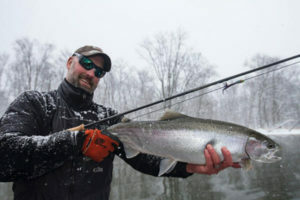 Unlike summer months when dawn and dusk may be the best times for catching, smackdab in the middle of the afternoon is usually best for fly fishing in winter. It’s during this time when the waters will warm to their maximum for the day, and all it takes is a half-degree rise in water temperature to turn inactive fish active. And unlike other times of year, the brighter the sun overhead the better the bite can be. Even if your legs are strong, it’s not only a good idea to have a wading staff with you, but to use it. One quick jab into the river bed and you’ll be able to catch your balance if, say, a rock overturns under foot. Donning ice cleats with small carbide spikes, like the slipover Ice Creepers from Frabill ice anglers wear, will keep you steady-footed if it’s cold enough that ice starts forming on the rocks, or in areas with algae covering the bottom. Overall, fly fishing in the heart of winter isn’t all that different than the summer months. Your goal is to imitate nature to a tee with nothing more than feathers and fur that’ve been spun onto a hook. As I learned from my last trip to the Colorado Rockies, keeping your fly drifting behind a thin, strong, and nearly invisible fluorocarbon leader will up your odds greatly. 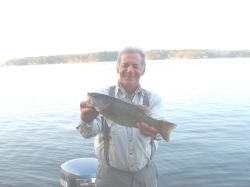 This entry was posted in fishing basics on January 25, 2018 by ronniegarrison.